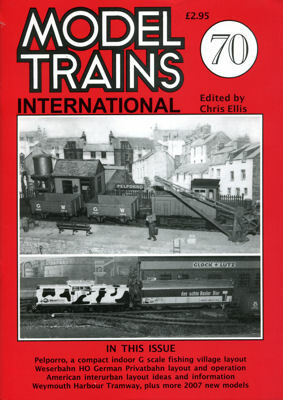 Editors thoughts on reaching the 250th model railway magazine he has edited since December 1979. Some record! A 5ft x 1ft American N gauge switching layout with traverser, but suitable for multi-mode. The American Interurban era and scene as the basis for a different kind of layout, and a slice of California. Looking back over 75+ years in the hobby and adventures along the way. On the Privatbahnen (private lines) theme an HO layout with a 'reverse inglenook' plan set in Germany. Weymouth was the only town in the UK with a GWR main line running through its streets so to serve the Channel Island steamer services from the harbour. And makes a different subject for a layout. A compact nicely modelled 3'6" gauge light railway linking the GWR with a small Cornish fishing village. Various misadventures and their outcome with a potted fictional history of the piers origins.